Director Dwan described the difficulty of creating the sandstorm: "I got about a hundred of those huge airplane prop fans we used to make a wind and lined them up, but I had to discard them because the sand would cut the skin off the cast. Instead we used ground cereal that we threw in front of the blades. The people had to move through that all day long, and I'm telling you, that was an ordeal. 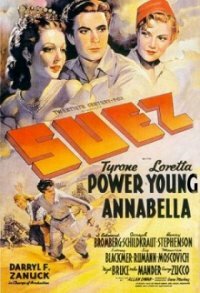 Everybody got beaten up good -- particularly Tyrone Power Power and Annabella." Tyrone Power became romantically involved with Annabella, the young French actress who played Toni. They were married the following year. 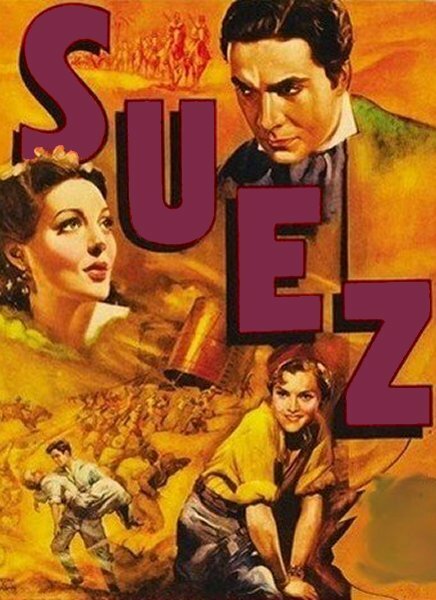 This was the last film that Tyrone Power and Loretta Young made together. They had been a very popular team, appearing together in four previous films (Ladies in Love, Love Is News, Cafe Metropole,and Second Honeymoon). She and Power were always good friends, but she did feel that he overshadowed her in the movies that they made together. She was a star prior to his becoming one, yet, once he hit stardom, he was almost always billed over her. She left 20th Century-Fox the year following Suez. Ferdinand de Lesseps's descendants filed a lawsuit against the filmmakers. The complaint cited great inaccuracies between the movie's character and the real de Lesseps. Among the complaints were that Tyrone Power was much younger than de Lesseps was when he started the canal project. Also, de Lesseps was not a single man, as portrayed in the movie but a 54-year-old widower with five children. After finishing the canal, he again married and had a dozen more children.